"The sparkles have settled on the first ever international Guild of Energists (GoE) Energy Conference in Eastbourne, and I can happily say it was the most extraordinary, enlightening and entertaining conference I've ever had the privilege of organising and being a part of," writes GoE editor and conference organiser Stephen Kent. To celebrate our first conference as The GoE, all delegates were also given a special welcome bag that included many exclusive GoE treats including branded pens, pin badges, and hand-made energy “mens” created by Silvia Hartmann. With over 100 energists in attendance from all four corners of the globe and presenters from six different countries, the GoE Energy Conference 2016 is an experience that will be remembered for a long time to come. GoE president Silvia Hartmann kicked off the conference weekend with “We LOVE Energy!” where she talked about the future of modern energy us officially becoming The GoE this Autumn. New author and GoE trainer Susan Browne talked about her new book “Angel EFT” and the wonderful synergy of modern Energy EFT tapping and working with the Angelic realms, one of the most popular talks of the first day. Amongst the other talks on Saturday included GoE trainers Silvia King and Jorge Vence providing practical and insightful modern energy talks “Find The Right Energy, Speak With Confidence!” and “Coaching The Coach!”, before the charismatic Susan Kennard closed day one with her transformative talk “Sparkle To Success!” where shared her journey through adversity to success. Saturday night saw the return of the Energy Party to The View Hotel where dozens of sparkly energists boogied down to their favourite tunes in front of our professional DJ and light system. Day two kicked off with a bang as Energy Conference favourite and Biofield Sciences founder Dr. Thornton Streeter presented his talk on “The Biofield – Research That Supports Energy Medicine & Healing” where he talked about exploring the known anatomy and physiology of the human Biofield, including taking a closer look at the chakras. German GoE trainer Ilka Wandel presented Silvia Hartmann's “Energy Constellations” for the first time, a modern energy inspired take on the popular Family Constellations technique. NLP and business expert Jimmy Petruzzi returned to present back-to-back informative talks on “Excel At Sports - Working With Professional Athletes” and “Lead Your Business Effectively, Efficiently and Profitably”, before Silvia Hartmann closed another memorable conference weekend with “SuperMind”, a talk about the techniques and the next-level course which is the follow-up to Project Sanctuary. A big GoE thanks also goes out to Jacqueline Besseling, Barbara Saph, Ray Manning, Wendy Birse, Aisling Killoran, Fiona Dilston, Sandra Hillawi, Samantha Moray, Lisa Jennings and Teresa Lynch who's presentations contributed to our most memorable and energy-rich conference yet! 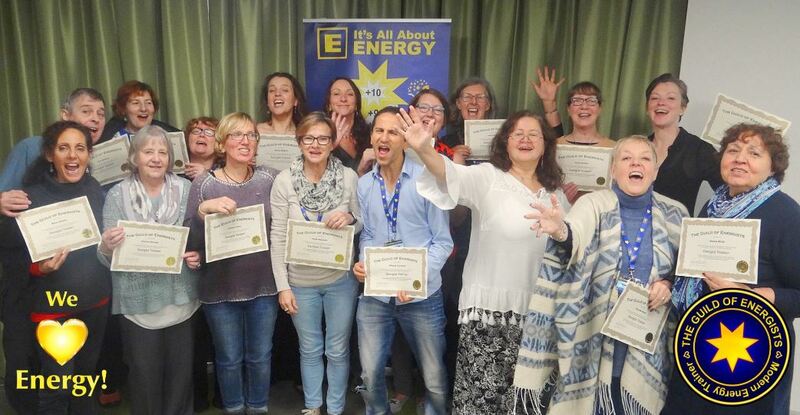 Eastbourne also hosted an extensive programme of GoE certified live training courses which included a special EMO Master Practitioner training, taught by Jorge Vence, and Master Class workshop from course creator Silvia Hartmann, as well as 16 energists obtaining the GoE Energist Trainer certification from master trainer Sandra Hillawi. Check out our album of photographs from the GoE Energy Conference 2016 by following the link below. Remember to tag your friends and fellow energists! Thank you to everyone who attended, presented and overall made the GoE Energy Conference 2016 a wonderful experience. See you again very soon!